That lesson is that sometimes it is all about being in the right place at the right time. My day to day job is assisting the manager in the shop at the Whiski Rooms in Edinburgh. One of the best things about our shop is that it is blessed with a wonderful little tasting room. We often use this to host whisky tastings ourselves but we are quite often lucky enough to welcome along whisky companies to share their products with the public. Last Friday we had Bruichladdich hold an entertaining tasting (this was sold out) which I had imagined would be a selection of their substantial range but nothing out of the ordinary. How I was wrong. Craig Johnstone brought along a selection of treats from their range but the highlights for myself were getting to try samples of the new Black Arts 3 and the aforementioned Octomore 5.1. A review of the Black Arts will follow, I promise, but right now I’ll focus on the peat sensation that is Octomore. I’d like to mention at this point that there have been some issues between EWB and Bruichladdich in the past. They have made some whiskies we haven’t loved. 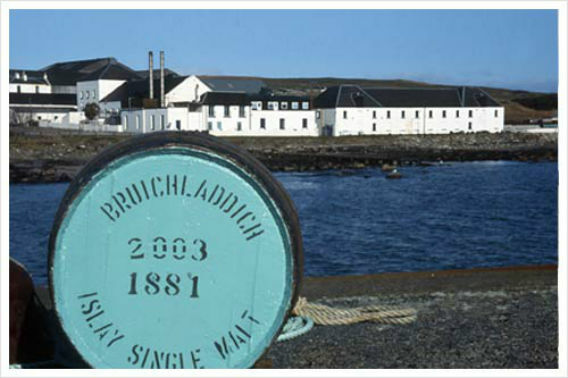 That’s not to say we just don’t like Bruichladdich it’s just that that some particular spirit didn’t agree with us. We just write what we feel at the time. There is no vendetta/conspiracy/reason in the world for us to hate Bruichladdich so I would like to treat all that has passed before like water under the bridge. On that note however I’d like to state that I’ve never been the biggest champion of super peaty whisky. We will have to see how this review goes. The sample I have might be a little different to what you get in the bottle. I’ve heard it’ll be hitting shelves about December time but things change a lot in this crazy whisky world so don’t you think that date is set in stone. In a change for the Octomore range the 5.1 is simply the 4.1 another year on. That makes it 6 years old. Is that enough information? I hope so because that is all I have! This is a preview dammit! Nose: In a move that will surprise nobody it immediately smells of smoke, peat and tar. Getting past that obvious factor you start to find grass, straw and a slight mint quality. There is definitely some notes of grains coming through from under all that smoke and a sweet note that I just can’t put my finger on. It could be what we have mentioned as the ‘play-dough’ note being balanced out with the bigger flavours. There is certainly a saltiness that works with the smoke. Palate: A full on hit. If the high alcohol doesn’t knock you for six the smoke will. Weirdly they kinda make for a sort of balance so you don’t notice one more than the other. There is a sweet pear note hinting through and those grains are still hanging around. As I mentioned before I’m not a huge fan of super peated whisky but what makes this work for me is how it feels; the flavours are balanced with the smoke. It is smoke on smoke on smoke but there are other flavours coming through here. This entry was posted	on Wednesday, May 16th, 2012 at 11:42 pm	and is filed under Reviews. You can follow any responses to this entry through the RSS 2.0 feed. Responses are currently closed, but you can trackback from your own site.